Hansen Makes a Statement in the Gotham Stakes! 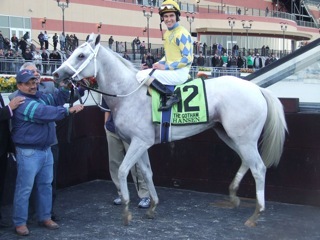 My post-Gotham Stakes article, that ran on HorseRacingNation.com/blogs/NYState, matches up with any that were written. Please enjoy. After finishing second to Algorithms in the Holy Bull (G3) at Gulfstream on Jan. 29th, many felt that Hansen needed to make a statement in his next Derby prep race. He did just that and more in the Gotham Stakes (G3) at Aqueduct. Hansen swept from off the pace to a three length victory. Hansen who came into the race with the most earnings of the three-year olds on the Derby trail, with over $1,200,000 and qualifiying graded stake purses of $1,160,000, added another $240,000 to his bankroll. Hansen was bet down to $.80-1 and paid $3.60 to win.